I'm back at making my favorite creations. I took a break so that I could teach piano and now that lessons are over until September, I have more time to create. This is the newest creation (July 2012) in my line of teacup night lights. 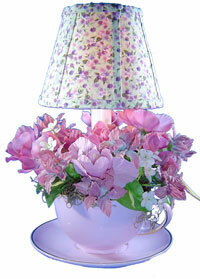 It has a mauve-lavender teacup trimmed with gold in which I've added an electric candle light and silk flowers. The handmade lampshade is round. The hardbacked shade is made with fabric of lavender and pink flowers on a light green background and trimmed with the same fabric. The electric candle lamp has on/off switch on the six foot cord. It uses a 7-watt candelabra bulb. It measures 10-1/4" tall.